Although it's not the most talked-about aspect of buying a home, escrow is nonetheless a vital component of a successful transaction. Your RE/MAX Realty Affiliates agent can answer your questions about escrow and help you through the process. Here's a brief overview on what escrow is, and how it works in the overall scheme of things. Escrow is an arrangement in which a neutral third party holds onto funds and key documents involved in a home sale, and then distributes them according to the agreement between the buyers and sellers. The escrow period begins when a seller accepts a buyer's offer, and ends at the closing table. Purchasing a house isn't like every day purchases; there's a lot of money involved, a lot of steps to manage, and a lot at stake. So the buyers and sellers don't exchange money and documents directly with one another. They do it through the escrow account. An escrow account opens up when buyers put down earnest money to show the sellers that they’re serious about buying the home. An escrow officer – usually someone within a title company – is assigned to the account. • Holds funds and documents. • Processes and facilitates the flow of documents and funds. • Keeps all parties informed of progress. • Responds to the lender's requirements. • Secures a title insurance policy. • Obtains approval of reports and documents from all parties. • Prorates and adjusts insurance, taxes, rents, fees, etc. • Records the deed and loan documents. • Keeps track of and holds onto money owed and money deposited. Escrow closes when all the tasks, documents, and funds are performed or secured by the escrow officer. What's My Role in Escrow? Both buyers and sellers have responsibilities during the escrow process and must do their respective parts to keep the transaction moving. 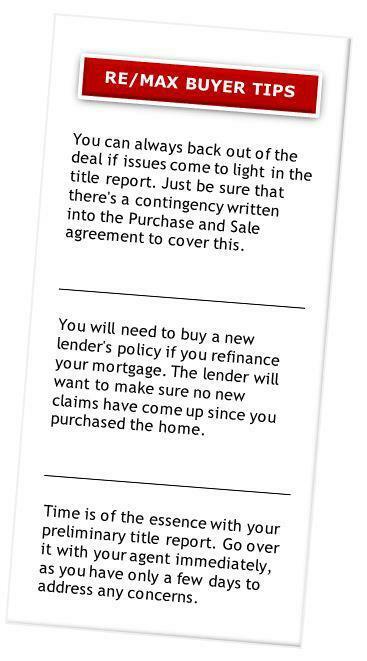 Carry out all escrow instructions. Provide the deed, via the escrow officer. Submit a down payment, plus any other funds required. Approve inspection reports, preliminary title reports and other items detailed in the Purchase and Sale agreement. Execute a Deed of Trust to secure the loan. Title insurance is a policy that protects against financial loss stemming from problems found in a property's title, or legal ownership. Think of it this way: As the buyer, how do you know the seller really owns the property? How can you be sure there are no liens, such as from unpaid taxes and lawsuits, or undisclosed heirs who might claim ownership? The answer lies in the title search. A good title search generally turns up these types of issues and a good title insurance policy will protect you should they arise during your ownership. A real estate agent can answer your questions on title insurance and direct you to a title company, but at the same time, it's good to understand some of the basics. There are two policies for title insurance – one protects the lender, and the other protects the homeowner. Lender's Title Insurance: This insurance protects the lender, who technically owns the home until you pay off your mortgage. You'll pay a one-time premium at closing, which protects the lender for up to the full amount of the loan as long as you have the mortgage. The answer is that no title search is perfect. Without an owner's policy, someone could show up on your doorstep one day and say, "Hey, this is my house. The person who sold it to you never got the proper signatures from my now-dead relative, and according to his estate, I own this place." Your owner's policy covers you for any losses in this case. Although a lender’s policy is required for closing, the owner’s policy is not, and you may not be asked if you want it. Speak to your agent about buying one during the escrow process. What time frame does title insurance cover? It's important to understand that insurance covers the buyer and lender only for events that occurred before the purchase date. It does not cover future events or any clouds or defects that arise after the purchase date. In other words: If the buyer does something that causes a lien to be put on the house, the title policy will not cover the loss. What kinds of claims are covered? What should I look for in the preliminary title report? Liens: A lien is a legal claim of ownership. Anyone the homeowner owes money to – such as unpaid contractors or tax authorities – can put a lien on the home. The most common type of lien is the one your lender will have on your home for as long as you have a mortgage. Encroachments: An encroachment is something that crosses the neighboring property line. The best example would be a fence that has been placed improperly. Easements: An easement is a legal right to use another person's land for a specific use. For example, you might have an easement to run your sewer line through part of your neighbor's property. An easement doesn't give right of possession; just the right of access. How do I address problems that arise in the title report? Your agent can help. Some issues, like easements, can be worked out, while others may be enough reason to walk away. The key is in understanding the issues and talking them through with your real estate agent. An easement isn't always cause for alarm, but if you discover one, be sure to investigate it with your agent.